Bolch, T. (2007). 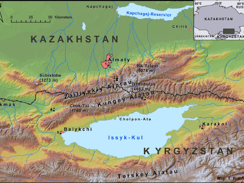 "Climate Change and glacier retreat in northern Tien Shan (Kazakhstan/Kyrgyzstan) using remote sensing data." Global and Planetary Change 56: 1-12. This paper uses the TM4/TM5 ratio method but instead of LiDAR uses an ASTER-derived DEM. The temperature increase in Tien Shan from 1950 to 2000 was two times higher than the global average. An overall decrease in glacier extent of 32% from 1955 to 1999 based off prior Soviet Glacier Inventory. The retreat was dependent on size, location, climate regime of the glaciers. The big takeaway for me from this paper was that retreat of humid maritime glaciers was much greater than their continental counterparts. But, under dryer conditions with high solar radiation the retreat of continental-type glaciers can be even greater than the maritime (perhaps this can explain glacier NP). -More humid glaciers in Tien Shan retreated faster than those in more continental areas. In my paper maybe compare the rate of decrease on Hood and Rainier to more continental glaciers northern rockies? -In this area radiation accounts for 80-90% of ablation. -Tobias analyzed the climate by using 16 time series of temp & precipitation from 16 weather stations at various altitudes. -What does he mean by “important luv and lee effects of the precipitation”? -He modeled the radiation using a “sunray” program? -For this area he used at TM4/5 ratio image with a threshold of 2 to dilineate the glaciers and misclassified pixels of vegetated areas and lakes were eliminated using NDVI. -Bolch didn’t really clearly explain why or how he chose this threshold. I’d like to be a little more clear as it is what he ultimately gets all of his ablation figures from and if it was arbitrarily chosen his figures could not be representative. -He mentions the use of morphometric parameters and slope from other papers (Bishop 2001, Paul 2004) to delineate the debris covered glacier tongues. But he only says “problems arose” and didn’t explain how he accounted for these problems. -The most sensitive geomorphometric parameter describing the surface of glaciers is the curvature so he calculated the vertical and tangential curvature using the DEM. He used the curvature in a cluster analysis with “SAGA” software to delineate the debris covered tongues clearly. -It appears that Bolch sees the same non-continuous increase in temp that I’ve seen in other papers as well. He does note that urbanization in the area may skew the data towards warmer temps. -Bolch compares temperatures by season and found that there is a greater increase in temp in autumn and winter. Perhaps I should do the same. -Bolch found that three glaciers had advanced and the continental glaciers in one valley had a very small retreat. Bishop, M.P., Bonk, R., Kamp, U., Shroder, J.F., 2001. Terrain analysis and data modeling for Alpine glacier mapping. Polar Geography 25, 182–201. Haeberli, W., Beniston, M., 1998. Climate change and its impacts on glaciers and permafrost in the Alps. Ambio 27 (4), 258–265. IPCC (Ed. ), 2001. Climate Change 2001 — The Scientific Basis. Contribution of Working Group I to the Third Assessment Report of the Intergovernmental Panel on Climate Change. Cambridge University Press, Cambridge. Oerlemans, J., 1994. Quantifying global warming from the retreat of glaciers. Science 264, 243–245. My impression from the literature is that maritime glaciers are very sensitive to precipitation. Because they are already close to the melting point, they are also sensitive to temperature. Changes in precipitation in these regions can greatly affect glacier mass balance. However, remember that such changes in precipitation can be caused by climate variability such as NAM, ENSO, etc. and may not be representative of climate trends. The trends in temperature are much easier to identify than trends in precipitation (because of high variability and difficulty in measuring precip). Choosing the threshold of ice vs. non-ice seems to be quite arbitrary. The more you can substantiate your choice of threshold, the better. I don't know what SAGA is. I suppose that you could do this in ARCGIS but not sure we need to do so.